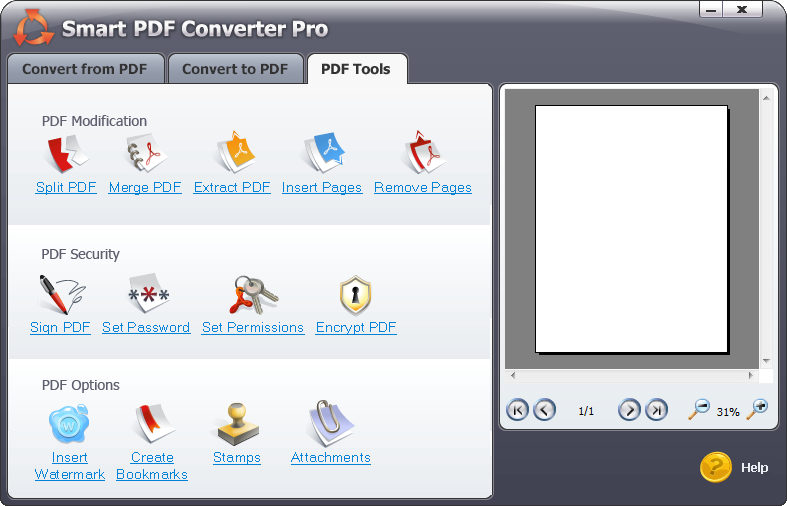 Smart PDF Converter has a convenient interface which enables you to convert your PDF documents in just a couple of clicks. Add the file you wish to convert, select your preferred output format, a destination folder for the converted document, and click Convert. You can also create PDF documents. To convert a Word, Excel or image file to PDF, go to the To PDFtab, click Add File, select your document and then click Convert. You can easily create PDF documents by right-clicking a document and selecting Convert to PDF. Or, you can also print the documents to the virtual SmartSoft PDF Printer. 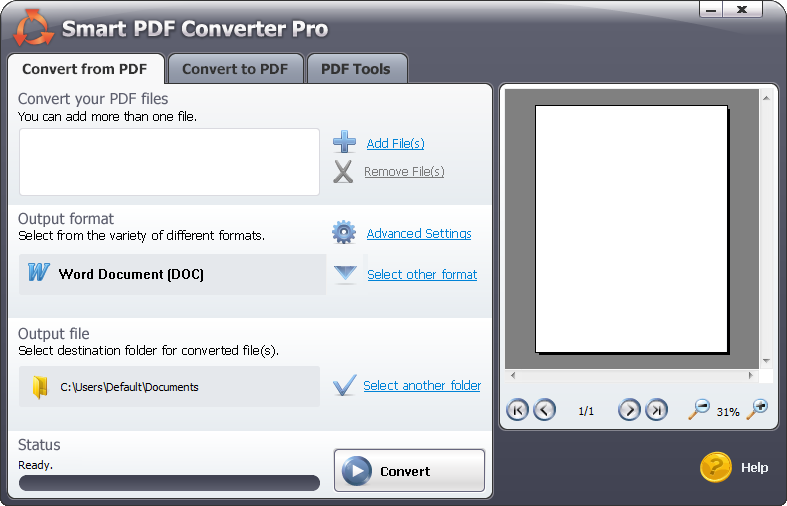 Smart PDF Converter Pro also comes with a convenient set of tools which will help you manage your PDF documents. You can split a PDF documents into two or more files, merge several documents into a single PDF, extract parts of a PDF documents, as well as insert or remove particular pages. Add your digital signature to a PDF document, or encrypt your PDFs to prevent other people from viewing, modifying, copying or printing them without authorization. Personalize your PDF documents by adding custom watermarks or stamps with images and/or text. For long PDFs, you can create bookmarks and tables of contents to arrange and easily locate different parts of the document. 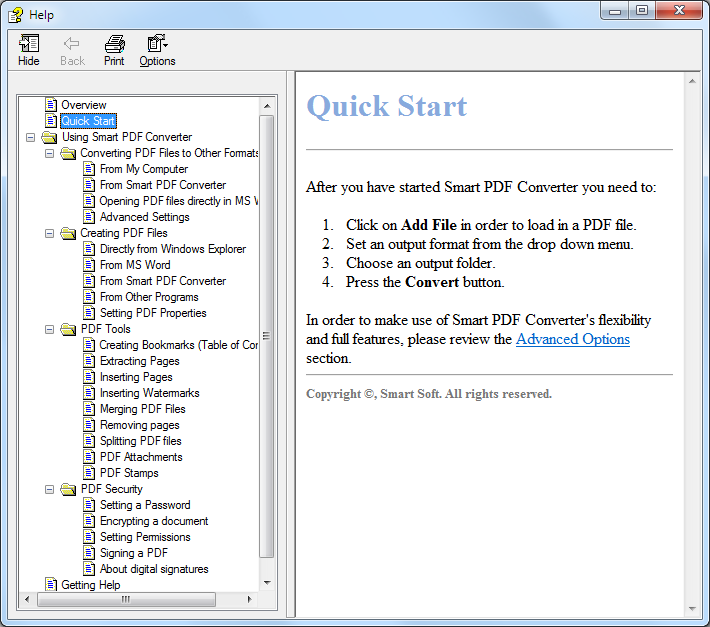 With Smart PDF Converter, you can also add attachments to your PDF documents. Smart PDF Converter will optionally add additional options to your drop-down menus on right-click to enable you to convert your documents without even having to start the application. You can create a PDF document instantly by right-clicking a document and selecting Convert to PDF. When creating a PDF document, the application allows you to include a title, author name, subject of the document, and keywords that will enable you to easily locate the file. Create highly-secure PDF documents with Smart PDF Converter Pro. Prevent your files from being copied, distributed, signed, printed or even viewed. Smart PDF Converter allows you to select additional options for your PDF documents, such as your preferred layout and page mode, type of compression, or PDF version. 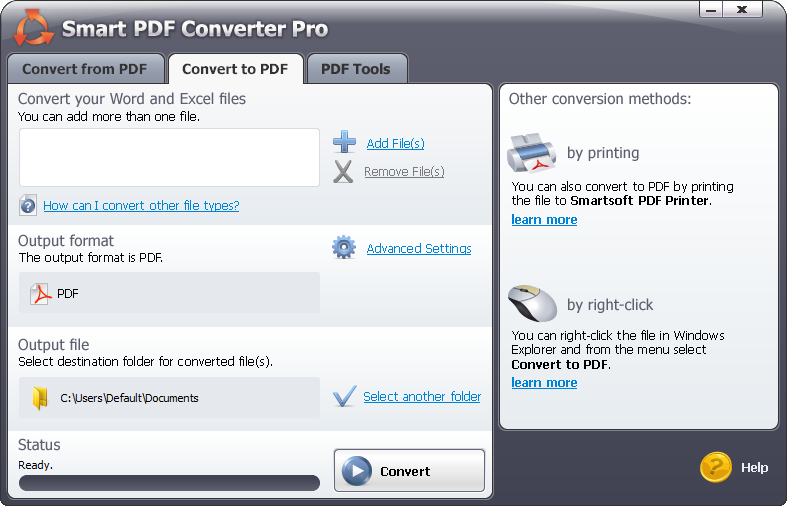 Smart PDF Converter is easy and fun to work with. If you, however, find any difficulties, consult the Help file included in the application for a step-by-step guide on operating the software.